Springwood United Football Club would like to welcome Blue Mountains Computers as a Sponsor for Season 2017! Blue Mountains Computers offers all their customers the best possible solution to almost all their computer needs. Not only are their prices very competitive - they also come to you!!! Blue Mountains Computers have been servicing the Blue Mountains area since 2010 and have built a very good reputation amongst their customers. Servicing primarily the Winmalee, Springwood, Faulconbridge and Blaxland areas, Blue Mountains Computers also services multiple business around Australia via remote support. Springwood United Football Club would like to thank Blue Mountains Computers for their support for 2017!! Domino's Pizza Springwood offers fast delivery within the Springwood area. Check out their online menu to see the wide range of pizzas, chicken, sides and desserts they have to offer. Springwood United FC would like to thank Domino's Springwood for supporting our Club! PhysioPoint Springwood is a new clinic run by Oliver Weber, an Accredited Sports Physiotherapist with 20 years of private practice experience. With physiotherapist that strive to give each patient that comes through their practice a thorough understanding of their injury and a plan to get them through the progress of the rehabilitation. Patients are given the tools to manage their injuries as opposed to passive treatment requiring endless return visits "the merry go round treatment". PhysioPoint's physiotherapist will educate you through every step of your diagnosis and rehabilitation so that you can make informed decisions in regards to your ongoing healthcare and well-being. 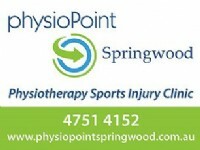 Springwood United Football Club would like to thank PhysioPoint Springwood for their ongoing support!! Springwood United Football Club would like to welcome Ezi-Bin as a Sponsor for Season 2017! Ezi-Bin delivers from Penrith to Blackheath 7 days per week. Areas that fall within the delivery areas can benefit from the same day service! Ezi-Bin staff can load their bins quickly and efficently to save you even more time and effort. From a simple garden shed clean out, to a whole house when moving. With their range of Bobcats and Excavotors Ezi-Bin can also organize for the removal of that pile of bricks, concrete or earth that has been filling that corner of your yard for too long, or just seems to hard to tackle by hand. Give them a call today on (02) 4754 4740 (Blue Mountains & Penrith) or (02) 4776 2800 (The Hawkesbury) for a quote and we can clean it up for you - With Ezi-Bin, it's too Ezi!!! Springwood United would like to thank Ezi-Bin for supporting our Club!!! Located at 16 Waratah Road, Warrimoo, Warrimoo Kitchens is an established family owned & operated business since 1985. Warrimoo Kitchens are committed to working with you to combine your ideas with their expertise in creating a stunning kitchen just for you!! Whether you favour a sleek minimalist look, something romantically traditional or if you long for the unique, they help you create it. You'll find the staff at Warrimoo Kitchens will strive to provide you with a friendly, professional and individual experience throughout your entire project. Springwood United FC would like to thank Warrimoo Kitchens for supporting our Club throughout season 2017! Springwood United welcomes the Winmalee Tavern as a Team Sponsor for two Springwood O35 Division 1 teams. The Winmalee tavern is a family owned business located near Winmalee Village center offering great service, quality, affordable dining and all the entertainment you need. -	ED'Z BISTRO is open every day 11am - 9pm with '10 meals for $12ea' every day, plus additional menu and set daily specials. Now offering made to order pizza's, available to dine in or take away! -	TAV TRIVIA - A Fun and friendly competition every Wednesday night from 6:00pm - 7:30pm. FREE entry and all players receive a lucky door prize ticket. Fresh meat and fruit trays to be won! Springwood United FC would like to thank the Winmalee Tavern for their support in Season 2017!!! Springwood United welcomes Metro Petroleum as Team Sponsors for Springwood United's U16 Division 1 Team. Metro Petroleum is a major petroleum retailer servicing over 40,000 private and commercial clients. They are one of Australia's largest independent service station franchises, committed as the number one service station for fuels, lubricants, and convenience. Today, Metro Petroleum has their own trucks, fuels tankers, and drivers as well as services stations with depots, offering services and employment to many people. The company is one of the largest independent franchises in the country with over 180 service stations in the network. Springwood United FC would like to thank Metro Petroleum for their support in Season 2017!!! PSC Insurance Group focuses on being the trusted insurance and risk management partner for its diverse range of Small to Medium Enterprise (SME) clients. A publicly listed insurance intermediary business, PSC Insurance Group has a proven track record protecting the business and personal assets of SMEs in Australia, New Zealand and the UK. The PSC Insurance Group focuses on servicing the detailed insurance needs of SMEs. Our clients are the focus of everything we do, from providing exceptional client service to offering innovative and value added advice and products. Springwood United FC would like to thank Alex for his support in Season 2017!!! Springwood United Football Club welcome Kylie Pickham from Aussie Home Loans as a Team Sponsor for the O35/4's, AAL/1's and the AAL/6's teams. Aussie have been working on home loans for 25 years - finding innovative ways to give Australians a better deal on one of life's most important purchases. Whether it's scanning across almost three thousand home loans on the market, or holding a large panel of lenders to account, Aussie won't be deterred from the case. The more options that appear in the home loan market, the more important it is to have the right people by your side. - Aussie's expertise is free!! It doesn't cost you anything and you will be provided mortgage advice and help you find the right loan. - Aussie cuts out the legwork! Comparing thousands of loans from up to 21 lenders, negotiate great rates and manage the paperwork on your behalf. - Most importantly Aussie will fit your schedule and meeting you at a time and place that suits you. Springwood United Football Club would like to thank Kylie Pickham and Aussie Home Loans for supporting our Club in season 2017! !